Home / Opinion / Trending Now / Jay Sonza: "HINDI KAYA NAHULOG SI JR TRILLANES SA BITAG NI RJ NIETO?" Jay Sonza: "HINDI KAYA NAHULOG SI JR TRILLANES SA BITAG NI RJ NIETO?" 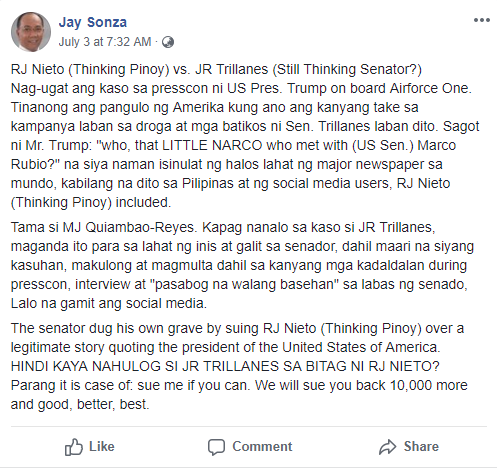 Jay Sonza veteran broadcaster and former TV host, once again wrote a very striking opinion, this time about the recent feud between Thinking Pinoy blogger Rey Joseph “RJ” Nieto and Senator Antonio Trillanes IV. Known to be fearless in speaking his mind to various political issues, Sonza then again took to social media to give his standpoint on the cyber libel case filed by Trillanes against Nieto. On his latest Facebook post, the veteran journalist recounted how the conflict between Nieto and Trillanes began. According to Sonza, the case rooted on US President Donald Trump's presscon on board Airforce One. It has been reported that the American president was asked what was his take on the campaign against narcotics and the criticisms of Senator Trillanes against it. Trump allegedly answered and asked the identity of Trillanes. "Nag-ugat ang kaso sa presscon ni US Pres. Trump on board Airforce One. Tinanong ang pangulo ng Amerika kung ano ang kanyang take sa kampanya laban sa droga at mga batikos ni Sen. Trillanes laban dito. Sagot ni Mr. Trump: "who, that LITTLE NARCO who met with (US Sen.) Marco Rubio? ", Sonza said. That answer of President Trump, as per Sonza, brought fuss around the globe and almost reported and written by most of the world's major newspapers including the Philippines and social media users, RJ Nieto (Thinking Pinoy). 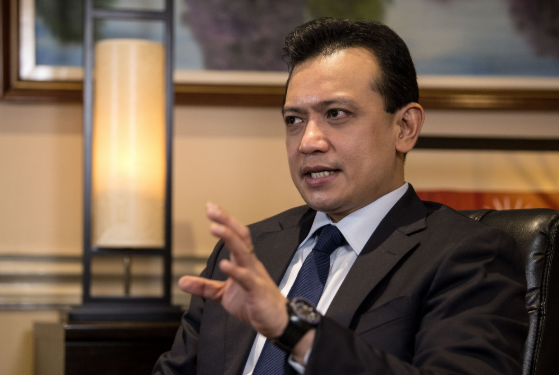 Now, after blogger Nieto's October 31 post where he said that "US President Donald J Trump purportedly called Senator Antonio Trillanes IV a 'narco, Trillanes then filed a libel case against Nieto on November 22, 2017. Sonza likewise said that netizen, MJ Quiambao-Reyes' opinion was right for saying that if Trillanes will win the case, the people who dislikes Trillanes, will benefit from it because he will now be liable to be jailed, convicted and fined for his non-stop blubbering without basis during presscon and interviews outside the senate, especially on social media. "Tama si MJ Quiambao-Reyes. Kapag nanalo sa kaso si JR Trillanes, maganda ito para sa lahat ng inis at galit sa senador, dahil maari na siyang kasuhan, makulong at magmulta dahil sa kanyang mga kadaldalan during presscon, interview at "pasabog na walang basehan" sa labas ng senado, Lalo na gamit ang social media. ", the veteran journalist exclaimed. 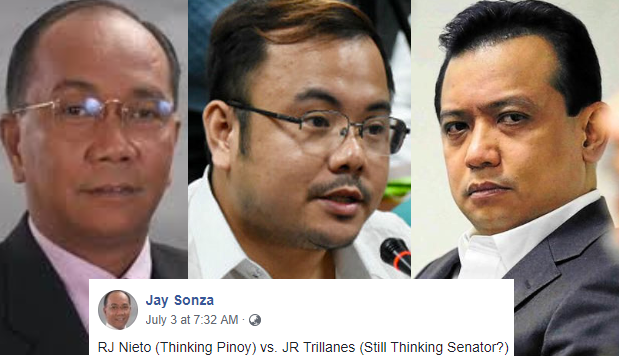 Further, Sonza ceased that Senator Trillanes caused his own downfall by suing RJ Nieto over a legit story citing the leader of the United States of America and asked "HINDI KAYA NAHULOG SI JR TRILLANES SA BITAG NI RJ NIETO?" Nag-ugat ang kaso sa presscon ni US Pres. Trump on board Airforce One. Tinanong ang pangulo ng Amerika kung ano ang kanyang take sa kampanya laban sa droga at mga batikos ni Sen. Trillanes laban dito. Sagot ni Mr. Trump: "who, that LITTLE NARCO who met with (US Sen.) Marco Rubio?" na siya naman isinulat ng halos lahat ng maj or newspaper sa mundo, kabilang na dito sa Pilipinas at ng social media users, RJ Nieto (Thinking Pinoy) included. Tama si MJ Quiambao-Reyes. Kapag nanalo sa kaso si JR Trillanes, maganda ito para sa lahat ng inis at galit sa senador, dahil maari na siyang kasuhan, makulong at magmulta dahil sa kanyang mga kadaldalan during presscon, interview at "pasabog na walang basehan" sa labas ng senado, Lalo na gamit ang social media. The senator dug his own grave by suing RJ Nieto (Thinking Pinoy) over a legitimate story quoting the president of the United States of America. HINDI KAYA NAHULOG SI JR TRILLANES SA BITAG NI RJ NIETO? Parang it is case of: sue me if you can. We will sue you back 10,000 more and good, better, best."